A reviving body scrub to help soften, smooth and refresh, for skin that is nourished, hydrated and intensely cooled. Natural Sea Salts sweep away dry, dull skin, Menthol and Lime cool and refresh, while Sweet Almond Oil nourishes and hydrates. Suitable for all skin types, especially dry, rough skin or those in need of a revitalising boost. Once or twice a week, massage into dry skin in upward circular movements. Pay particular attention to any dry areas, then rinse thoroughly. To enhance the benefits, follow with Energising Body Oil. Sodium Chloride, Sea Salt (Maris Sal), Prunus Amygdalus Dulcis (Sweet Almond) Oil, Helianthus Annuus (Sunflower) Seed Oil, Caprylic/Capric Triglyceride, Menthol, Limonene, Tocopherol, Citrus Aurantium Dulcis (Orange) Peel Oil, Citrus Paradisi (Grapefruit) Peel Extract, Cedrus Atlantica Bark Oil, Citrus Aurantifolia (Lime) Oil, Lavandula Hybrida Oil, Linalool, Eugenia Caryophyllus (Clove) Leaf Oil, Lavandula Angustifolia (Lavender) Oil, Pogostemon Cablin Leaf Oil, Rosmarinus Officinalis (Rosemary) Leaf Oil, Artemisia Herba-Alba Oil, Canarium Luzonicum Gum Nonvolatiles, Cinnamomum Zeylanicum Leaf Oil, Cistus Ladaniferus Resin, Ocimum Basilicum (Basil) Oil, Piper Nigrum (Pepper) Fruit Oil, Thymus Vulgaris (Thyme) Flower/Leaf Oil, Zingiber Officinale (Ginger) Root Oil, Vanilla Planifolia Fruit Extract. I absolutely love this scrub - a great smell and so invigorating and great for the body and the soul! Can’t recommend it enough. Love this product. Really improves the skin, especially legs. Leaves them looking and feeling great. I'd had this product used in a spa before and loved how soft my skin was afterwards so thought I'd treat myself. I was a bit worried it wouldn't have the same results but it does, my skin felt refreshed, smooth and soft afterwards. Definitely the best scrub I've used. This product is absolutely fantastic. It smells divine and leaves your skin with a tingling sensation which makes you feel invigorated. Only a small amount is needed as it is very potent. 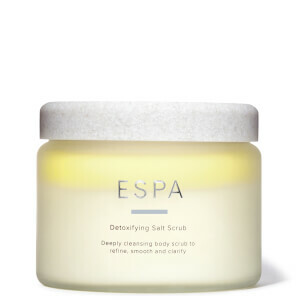 This is my fave ESPA product. This is one of the best products ever. It makes my skin feel soft and silky, simply love it.